Combining our extensive experience of smoking fish at the Dr. Lelykade with the new modern units at our current location gives our business unique opportunities. 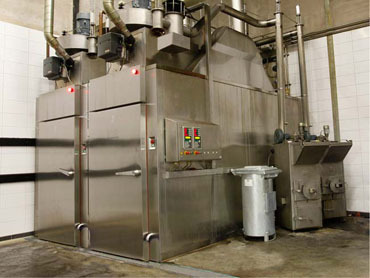 We run an efficient and high-quality production process in our multifunctional computer-controlled smokers. We produce both hot and cold smoked fish for our own shop and wholesalers in the rest of the Netherlands and other countries such as Belgium and Germany. We offer fast service and competitive prices. We mainly produce smoked herring, mackerel and sprat, but are able to supply other affordable and top-quality smoked fish as well. We comply with strict environmental requirements and our objective is to run our business as sustainably as possible.